My husband may be thrilled to believe that my youthful great-grandfather 'got some girl up the duff and scarpered to Canada', but I'm not at all convinced that he did. Or that his Uncle George did either. As for the solicitor who represented George Cockram in this case, I definitely found him. His name was John Arnoll Thorne, the son of Henry King Thorne and Susan Arnoll. 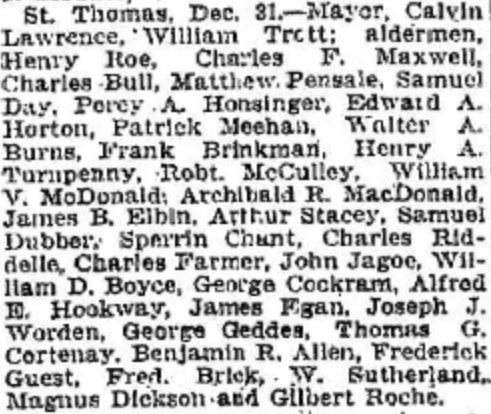 Uncle George's grandmother Thomasin Thorne had a brother called Thomas, who might have been John Arnoll Thorne's great-grandfather, but I can't find any evidence that makes that connection. If John Thorne was related to my Georges, the nearest relationship he could have would be second cousin once removed to Uncle George, and third cousin to young George. This is going to have to go on the backburner for awhile, as it's doing my head in, wandering down a lot of Thorne dead ends. I need to go to England to look at records that aren't available online, and that's not likely to happen. A word about the case relating to stealing salmon in Chulmleigh - I've dismissed this as a likelihood, as there were a couple of other George Cockrams living in Chulmleigh around that time, and the salmon stealer was far more likely to to be one of them than one of mine. A parliamentary election was coming up, and in Barnstaple, a committee was formed to work for the election of Thomas Cave and W Herbert Evans. Among the approximately 250 names listed as members of the committe, is George Cockram of Boutport Street. I'm reasonably confident that this is Uncle George, as I know he lived in Boutport Street in 1871 when the census was taken, and he was the only Cockram in the street. Extract from 1871 UK Census, showing George Cockram, coach maker, and his wife Ann in Boutport Street, Barnstaple, with a lodger by the name of Caroline Beer. Is it just a coincidence that 20 years later John Thorne's father had a servant called Emily Beer? Probably. If it is indeed Uncle George on the committee, this tells me a thing or two about him. On the same page of the newspaper are 'campaign' articles by the two candidates. They were members of the new Liberal Party, which favoured social reform, personal liberty, reducing the powers of the Crown and the Church of England (many of them were Nonconformists) and an extension of the electoral franchise. So I assume that Uncle George held with these views. I also assume that he wasn't any kind of a rogue, or he wouldn't be on the committee - not too likely that he was charged with being the father of an illegitimate child just a few months earlier. Here, George Cockram was on a jury. At that time only male property owners between the ages of 21 and 70 could sit on juries, which doesn't tell me much except that it couldn't have been young George, and if it was Uncle George, he owned his house. 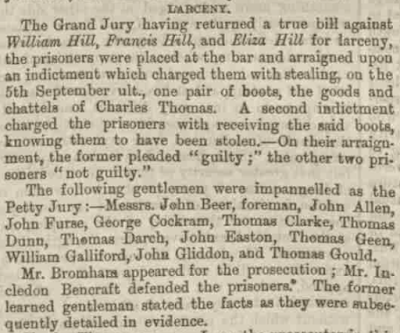 I'm interested to see that there was also a Thomas Geen on this jury - he was very likely Uncle George's brother-in-law. And the name Beer shows up here again too, but doesn't shed any light on anything. 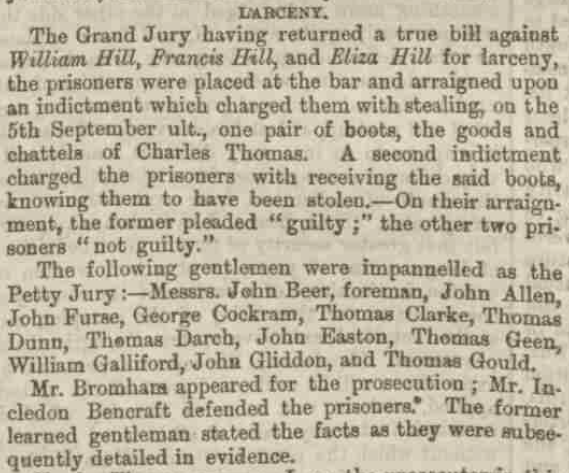 By the way, this case, about a stolen pair of boots, was written up in great detail, including the fact that the judge complained about the length of time the case occupied. The female defendant, Eliza Hill, was acquitted on the grounds that she was acting under the influence of her husband Francis. He was sentenced to six months hard labour, and his brother William to seven years. All for a pair of boots. Just one more thing, which I found in the Manitoba Free Press, Jan 1, 1907, page 14, in an article about upcoming civic elections in Ontario. Uncle George and his wife lived in the town of St Thomas, Ontario, where he worked as a railway car inspector from at least 1891 to 1911. 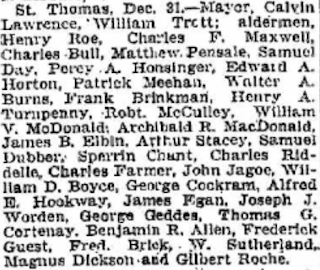 And here is his name amongst the list of men running for aldermen in that town. It seems that he didn't win, as his name doesn't seem to show up after the elections, but the fact that he was in the running suggests that he was a respected person in the town. So to sum up the results of my newspaper search, as inconclusive as they are, it seems that neither George nor his Uncle George ever got up to any serious mischief - or at least they never got caught getting up to anything. As for my question about whether Uncle George influenced and/or helped young George to go to Canada, I haven't found a shred of evidence one way or the other. As far as I can tell, they never lived nearer than about 200 miles from each other in Canada. So for now I'll leave Uncle George inspecting railway cars in Ontario, and get back to concentrating on young George aka Thomas Smith. Thanks, Jana - very much appreciated!